Greetings from the St. Augustine Amphitheatre Farmers Market! We’re taking over FMC’s Instagram this week to share with you a look into our market. The market is loved by our community, and for good reason! As a new “visitor”, there are a few things you ought to know to fully appreciate the market that surrounds you. Tucked into beautiful Anastasia State Park, the St Augustine Amphitheatre is a treasure to our sunny little ancient city. 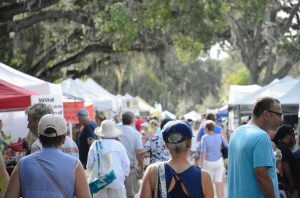 Run by the St Johns County Cultural Events Division, the St Augustine Amphitheatre is host not only to world class performing arts, but to a long-standing local tradition: the St Augustine Amphitheatre Farmers Market. For 20 years St Augustine has gathered at the Amphitheatre every Saturday morning, eager to come together around local food, art, and old time music. The St Augustine Amphitheatre Farmers Market is bustling year-round, with locals and visitors alike browsing the best of North Florida’s produce and prepared goods, snacking on their favorite market treats, and finding that perfect gift. Everyone stops to enjoy The Free Rangers, the weekly local jam session, picking out old time tunes on the Front Porch. It is a fine display of community and local economy! 2018 has a lot in store for St Augustine Amphitheatre Farmers Market! We kicked off the year with new monthly programming: Yoga at the Market and Tangible Taste cooking demonstration. With help from the Farmers Market Coalition and Fresh Access Bucks, we just began accepting SNAP/EBT and get to offer incentives for Florida grown produce. Next month, we’re joining the St Augustine Amphitheatre’s Green Hands Initiative and eliminating plastic grocery bags, sample cups, water bottles and straws from the market, and adding a composting program for food waste and paper goods. We’re also about to start our brand new Night Market! We are constantly inspired by the passion, hard-work, and creativity of the 100+ vendors that make up the Market each week. Our farmers push the limits of the term “growing season” by bringing in amazing produce all. year. long. Our “grocery” vendors make eating local even easier with fermented veggies, breads, and drinks. Our food vendors have the most diverse menus in town. In a town full of art galleries, our artists and crafters greet their customers face to face, lovingly sharing their work and inside market tips. Each Saturday morning, these fine folks go to work, and the incredible manifestation of our community springs to life. We are so excited to take over FMC’s Instagram account because we are so proud to share it with you!